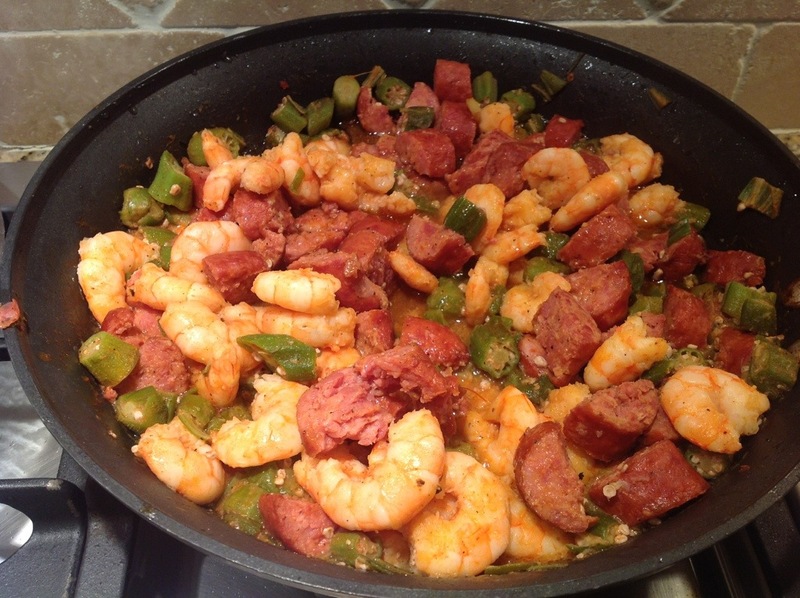 Category Pork, Seafood and tagged paleo, Paleo sausage shrimp and okra, paleo southern food, sausage shrimp and okra. In all of the craziness of getting ready for the parties this weekend, I probably went to the grocery store 10 times last week. On Friday night I was on one of my many grocery store trips, I had to wait in a pretty long line to check out. While waiting, I met one of the nicest ladies I have ever met. She started talking to me and by the time we were finished I felt like I had known her all of my life. Well part of our conversation was about cooking and she gave me this recipe and told me that I had to try it. She serves it over rice, but I thought it would be delicious just on its own. To make you will need: 2 tablespoons olive oil, 1 16 oz package of sausage sliced, 1 package of frozen okra, 1 lb fresh shrimp peeled, 1/4cup chicken broth, 1/4 cup tomato sauce, salt and pepper, Toni's seasoning. 1. start by sautéing the okra in olive oil until it is just starting to brown. 2. Now add sausage and let it start to brown. 3. Season with salt, pepper, and tonis. Let them cook and brown together. 4. Next add you chicken broth and tomato sauce. 5. Add shrimp last and cook until they are pink. 6. Let cook together, but not too long because you don't want the shrimp to over cook. This entry was posted in Pork, Seafood and tagged paleo, Paleo sausage shrimp and okra, paleo southern food, sausage shrimp and okra. Bookmark the permalink.